The following article was first published in Up the Gatineau! Volume 27. The Gatineau River Yacht Club had very humble beginnings back in the early 1960s, when a few Gleneagle residents got together and decided to form a sailing club. Five of us met one evening in September 1962, around a kitchen table in Ivan Herbert's house at Gleneagle, and set in motion the events that led to the formal creation of the Yacht Club. The founding members of the Club gathered around that kitchen table, in addition to Ivan, were John Winfield, Gerry Byers, Pat Evans and Allan Richens. The first name we planned was the "Gleneagle Sailing Club," but, after reflection, we decided that we wanted a more all-encompassing name. We settled on "The Gatineau River Yacht Club," a rather grandiose title for a club whose members had only five boats. John Winfield's sailing boat was home-made and Gerry Byers had a home-made rowboat, which was also equipped with a motor. Pat Evans' sailboat, called the "Spray, " was the largest boat in our little fleet, complete with a "cuddy," or covered cabin. The Herberts and Richens each had an enterprise-class sailboat, mahogany-hulled and blue-sailed. Typical scene along the original boom-walkway betwen the mainland and the island, with sailors preparing boats on race day. Photo: GRYC collection. The founding of the club traces back to an informal association of local people who moored their boats on a boom in Gleneagle Bay during the summer months in the 1960s. The Gleneagle Road, which begins at Route 105, crosses the railway tracks and then bends north, ending at the Gatineau River on Gleneagle Bay. This end of the Gleneagle Road served as the local beach then, as it does today, albeit for considerably fewer people at that time. The bay extended between the end of Gleneagle Road and two large cottages further north along the shore, occupied in the 1960s by the de Gaspé Taché and Roland Patenaude families. The boom where we moored our boats offered the most direct access for these cottagers to reach a road, as Williamson Road did not exist at that time; otherwise, they had to go along the railway tracks from Gleneagle Road. Ivan Herbert was the Club's first Commodore, and our fees were set at $5 a year to cover costs of placing moorings on the boom and maintenance of part of the road and the beach. The "Yacht Club" down in Gleneagle Bay began to attract interest and new members from up and down the river during those early years. We decided that to be a proper club we should have a Club House and, as luck would have it, a small white cottage at the bottom of Gleneagle Road owned by Rita Cross Mitchell (Carson Cross's sister) became available for rent in the spring of 1963. It was in an ideal location: right on the water at the end of the mooring boom.1 This Club House cottage proved a godsend as we could now offer some place for both young and old to gather and have the occasional party in the summer evenings. Our wives cleaned, painted and sewed to transform it into a meeting place. When the club was headquartered in the cottage, we began our first junior programs, which have been available to the community ever since. Among the first volunteers to manage the programs were Ainley Jackson, who had a cottage nearby, and Sirkka Olmholt-Jensen (the name of Ojai Road comes from the initials of her surname). Allan Richens acted as the first "Fleet Captain." When the club took over the cottage, the fees went up from $5 to $15 a year, a big surprise to many members. We held potluck suppers and community card games in the summer evenings and had corn roasts in the fall. While the fleet left something to be desired, our enthusiasm and horizons knew no bounds. At that time there was a small but also eager group of sailors over at Meech Lake, and it was not long before we were in touch with them with the idea that the new Gatineau River Yacht Club was a group to be reckoned with in the area. 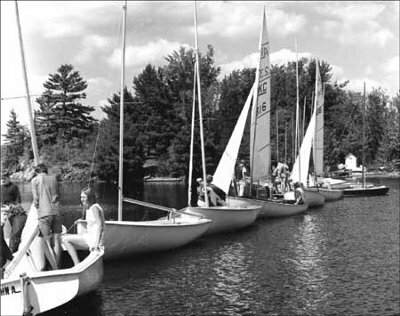 The Meech Lake sailors had "Y-flyers" and soon we also had some members with Y-flyers, which were very popular sail boats in the early 1960s. We invited the Meech Lake group to bring their boats over to our new club and have a day or weekend of races and fun, and they agreed, and we also went over to Meech Lake on a few occasions. The Gatineau River Yacht Club was soon organizing races. One of its first racing trophies was the CJOH Trophy, donated by Ernie Bushnell, the founder of the CJOH television station. Ernie was a longtime summer resident of Gleneagle, and the trophy was awarded to the winner of several racing events held over a weekend. No doubt Ernie was encouraged by Ivan Herbert, who worked at CJOH as a lighting expert. There were several avid sailors who worked at CJOH and were eager to come up to Gleneagle to sail, and each summer for several years we would hold the CJOH Regatta over a weekend, and invite different clubs throughout the area. The Gleneagle Bay would be very busy with all the activity and people-watching. One of my most enjoyable memories of those early days was the picnic and awards ceremony hosted by Ernie and his wife and family, and held on the lawn of the Bushnells' cottage. As our membership grew and our beautiful location became better known, we attracted larger and larger fleets to our open regattas over the summer. In the mid-1960s, there were two sailing clubs on Dow's Lake, the Royal Canadian Naval Club at HMCS Carleton, and the RA Sailing Club. They were located at the Dow's Lake Boathouse, which has since been demolished. Many of their sailors were only too anxious to leave the confines of Dow's Lake and enjoy the Gatineau River, and when these two clubs brought their boats up to Gleneagle we would sometimes have 40 boats go over the starting line for a race. The starting of the different groups was always quite an event, ably handled by Jimmy Brown, Rod Dougherty and Bruce MacDonald, who were teenagers at the time, sitting in a rowboat at one end of the line with a shotgun to signal the starts. After a short time there, it soon became apparent that the Club was outgrowing our cottage location and Rita Mitchell, the cottage owner, was concerned about the heavy usage of her property. The Club Executive began looking for new locations in an area between Tenaga and Kirk's Ferry. To our amazement, Air Commodore Bennett, who owned an island in the bay, complete with a lovely cottage, put it up for sale. Needless to say, all other potential sites were put aside as we immediately concentrated on ways to purchase this island. A group of us met one night at the home of Frank Macintyre, the owner-manager of Macintyre Realties, and, after much deliberation, we decided to put in an offer of $12,000 for the island. Frank called the Bennetts with our proposal and they accepted. We were overjoyed but very nervous, as we had to raise the money for the down payment from amongst our members. Tony Wright, one of our sailors, was a director of the Royal Trust Company. He had told us that if we could raise one-half of the island's purchase price, Royal Trust would lend us the balance as a mortgage. The Club had some money in the bank, and with repayable loans in various amounts from our members, we were able to reach the $6,000 down payment and meet the Royal Trust's terms. The Gatineau River Yacht Club became the proud owner of a new home on the island! A more perfect location could not be imagined to this day. The next problem was how to get over to the island from the end of the Gleneagle Road. The Gatineau Boom Company came to our rescue, thanks in part to Bud Smithers, a member with a cottage at Tenaga who was a forester and had made contacts through his work with some of the Boom Company's managers. The Boom Company placed a walkway over to the island. It was rudimentary but effective, provided that you moved quickly across and didn't congregate along the way or you would find yourself gradually sinking into the water. We learned that the hard way, but visitors were sometimes surprised. Albacore sailboats on a race day at the GRYC. Photo: GRYC collection. Members, both men and women, made efforts to adapt the cottage and its two sleeping cabins that adorned the island to new orientations as club house and changing rooms, and we prepared for a "christening ceremony" to be held on July 4, 1964. This was a big event for everyone in the community and we spared no effort. Commodore Fraser-Harris (whose cottage was across the river at the entrance to Blackburn Creek) had served with the Royal Navy and Royal Canadian Navy, and arranged for us to obtain the services of the Canadian Navy Band from HMCS Carleton. Doug Harkness, the Canadian Minister of National Defence, had a cottage at Gleneagle and attended the ceremony. Business firms with connections to National Defence presented the club with six one-person sailing "prams" for the junior program, thanks to Fraser-Harris and his military connections. These prams have been well looked after and some are still in use today! All the juniors in the club (and there were many) and most other people turned up in white outfits for our commissioning ceremony. The Yacht Club has been the scene of many memorable events over the years. I enjoyed the theme parties like the "Hawaiian Night," when the island was decorated and everyone came in Hawaiian dress. Events like this were eagerly anticipated by residents and cottagers in the area. A special sailing occasion I recall was a junior sailing event in 1963 at the Cornwall Yacht Club, a 24-hour race where each boat had to be sailed nonstop around a set course for 24 hours. The crews had to be changed on the run to see who could complete the most circuits. I went along on that occasion with our juniors and was in the sail boat for several laps during the night to help out. The team from the Gatineau River Yacht Club came first in the event. 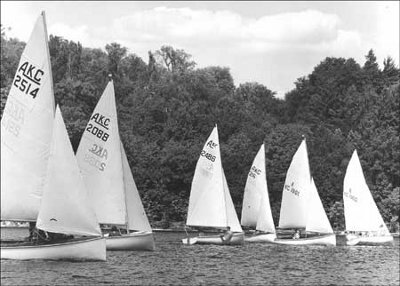 In 1967, during Centennial Year, the club hosted the National Centennial Junior Sailing Championships. Teenaged sailors from all over Canada arrived at the Yacht Club and were billeted with local families (including mine); they spent a week here sightseeing and competing on the Gatineau River for the Centennial Championship. The annual awards ceremony for the juniors took place each year around Labour Day, and there would be an event associated with this. All the juniors would have a sleep-over on the island: some would pitch a tent, some would sleep under the stars, and others bunk in the cottage. They would have a bonfire, hotdogs, etc. As you can imagine, all the kids looked forward to this end-of-summer-vacation fun under the stars on the island. This event was held up until about 1990 and then discontinued. The Club today is a tribute to all the members who, over the years, have contributed in one way or another to make it into such a beautiful island of enjoyment for all. By the year 2000, there were 270 adult and family members over the age of 13, with about 80 percent of this membership still drawn from the Gleneagle and Chelsea area. The Yacht Club's fleet has expanded from the original five in 1962 to eighty-three craft of all kinds in 2000, from canoes to cabin cruisers. Of the five sailors who met together and began the idea of a sailing club around that kitchen table, three have since died: Ivan Herbert, John Winfield and Pat Evans. Gerry Byers has moved to Wakefield and is no longer a member; Allan Richens still lives in Gleneagle with his wife, Joyce, and still sails at the Gatineau River Yacht Club. 1.This cottace has since been demolished and a large home built on the site.